KERMIT “MOOSE” MEYSTEDT gone at 69 years of age. Sorry this is last minute but it was just in Missourian this morning, and apparently few were aware that he was even ill. Remember he is brother to Diane Meystedt Legrand (CHS ’66). In speaking with his beloved son Jay, he shared that cancer of the liver was only discovered November 15th. Kermit was upbeat and enjoyed a wonderful Thanksgiving and Christmas with his family and close friends. All were optimistic. Last Friday night he suddenly experienced some pain and to be safe was admitted to the hospital to have it checked out. He digressed quickly and passed away at 9:45 AM Saturday morning. This happened so quickly that the family is in shock and prefers some privacy to mourn and come to grips with his unexpected loss . 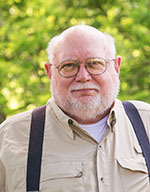 Kermit J. “Moose” Meystedt, I, 69, of Cape Girardeau, Missouri went to be with his Lord and Savior Jesus Christ Saturday, January 10, 2015. He was born in Cape Girardeau July 20, 1945, son to Clarence and Hazel Meystedt. Moose graduated from Central High School in 1963 and received a Bachelor’s Degree from Southeast Missouri State University in 1967 where he still holds the record for most points scored in a single basketball game, 52 points. He then went on to be drafted by the Kentucky Colonels of the ABA. Married November 6th, 1970, he faithfully led his family as a husband to Sandy Haney Meystedt of Cape Girardeau; a loving father to Madra (Michael) Jones of Cape Girardeau, Kermit Jay (Gabrielle) Meystedt, II of Cape Girardeau, and Aron (Lauren) Meystedt of Dallas, Texas; and grandfather to Graesen, Anna Clare, Savannah, Liviah, Kermit Jay, III, and he was anxiously awaiting the arrival of grandchild number six. Moose was an active member of Trinity Lutheran Church in Cape Girardeau and was currently serving on the Board of Elders. Moose and Sandy founded Genesis Transportation in 1982 and retired together June 30, 2012. During that time the Lord used Genesis as an outward expression of their faith in Jesus Christ to provide for countless missions across the United States. Here’s a link to the formal obituary with a photo. 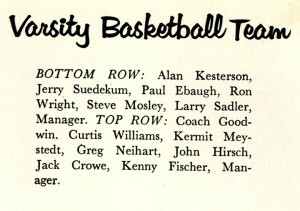 The yearbook reported that the varsity basketball team had an outstanding season: The school record for points scored by an individual in a single performance was broken by Kermit Meystedt when he personally accounted for 47 points out of a 98 – 53 victory in the Tigers’ final game against Farmington. Meystedt made second team all district, missing the first team by one vote, while teammate Greg Neihart made honorable mention. He went on to set a Southeast Missouri State College scoring record of 52 points in a game. Kermit was key in getting the final out in the 1962 State tournament finals in St. Louis. The whole story is in the 1963 Girardot, above. The 1962 Girardot indicated that Kermit was going to be a force to be reckoned with: The Freshman-Sophomore baseball team went undefeated in 1961, emerging victorious in seven contests. Kermit Meystedt, who played on both the varsity and Freshman-Sophomore team, led the team batting average with a .555 mark. As the 1962 varsity season got underway, things looked bright for the baseball Tigers. Returning from a 1961 squad, which compiled at 15 – 3 record, were twelve boys. The twelve lettermen included last year’s top three pitchers and two of the top four players in the RBI department. Steve Mosley, Alan Kesterson and Kermit Meystedt were the pitchers, and between them they hurled eight one-run games, seven shut-outs, three one-hitters, and two no-hitters, both pitched by Steve Mosley. The pitching staff had a phenomenal ERA opf 0.395. In the slugging department, Floyd King and Meystedt led. The Coach’s Comments in the 1962 Girardot pointed out that the Tigers had won the Big Eight and College High Christmas tournaments and city series competition. The only loss in the regular season was to the “powerful Advance Hornets, one of the top Class M teams in the state. The Tigers entered the State Regional with a 21 – 1 record. You can see Kermit in SEMO college action here. 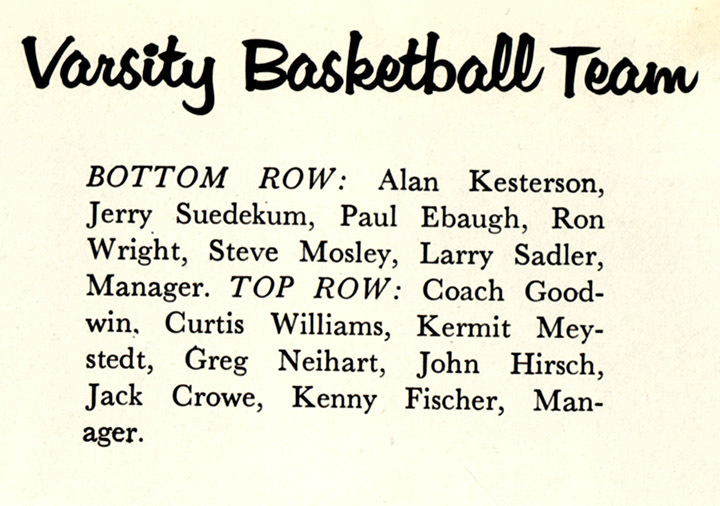 Oh, and the 1963 Senior Directory mentioned some things about Kermit that most of us probably didn’t know about him. In addition to his sports achievements, he was elected secretary and treasurer of his home room, and he entered the National Poetry Contest. The world needs more people like Moose and the world will miss this guy not being with us here. I feel compelled to write about Kermit. We were not close, as a matter of fact we seemed to always compete, being assigned to different teams whether it be Babe Ruth or Connie Mack baseball. Kermit was an outstanding pitcher so when you beat his team you really accomplished something. I believe he was the finest athlete of our era, as least among them. Although I hadn’t seen Kermit in a number of years it seems he was exceeded in his athletic abilities by his Christian beliefs and human qualities. My sympathies got to his family. I picture Moose @ Poplar Bluff standing on the free throw line waiting to shoot two free throws with Central trailing by two points with the clock reading 00:00. Everybody in the stands except his teammates was screaming at him. He made them both and then we won in overtime. After the game, in the parking lot, the losing fans were rocking our bus. In addition to his more noteworthy attributes described here and elsewhere, Moose and his sidekick were legendary members of the long line of Central High Mischief Makers. In light of his subsequent life, a tame tale will have to serve. Explaining that more detail was necessary the sketch was returned for added data. The following day Moose handed-in an extreme version that included the identity of each toenail. Rumor has it that this artwork remains in the CHS vaults. I guess Ken Steinhoff forgot about the first amendment right to freedom of speech. John Brown, if that’s who you really are, let’s get a couple of things straight. I don’t know what you mean about the First Amendment right to freedom of speech. I’m assuming that you were wondering where your first two posts went. 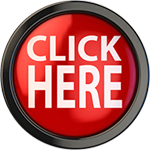 You probably don’t know that you sometimes have to refresh your browser in order to see new content. They were still there when I logged in. Having said that, I have only held back two comments since I started this blog, and they were personal attacks on another reader from several years back. I warned the writer he had two strikes against him and a third would get him blocked permanently. He apologized and hasn’t caused any problems since. I deleted YOUR first two strikes and I’m going to call the one I left up – your confusion about the First Amendment – a ball close to the strike zone. The First Amendment says that the GOVERNMENT can’t censor what you say (with notable exceptions). Perhaps you should have paid closer attention in Civics class. The first rule of the First Amendment is that freedom of the press belongs to he who has one. This is MY press and I’ll set the rules. If you really ARE John Brown, you’ll see this message; if you aren’t, then I guess it won’t make any difference. To the rest of you, sorry for the intrusion, but sometimes you have to carry out the garbage. And, now back to the show. Moose was older than I by a few years, but was always a fan of his basketball prowess in high school, as a SEMO INDIAN and in his brief stint in the ABA. Always a good guy was he and I’d see him frequently when he’d come into Buckner-Ragsdale to visit with his mom, Hazel, who worked for our family there many years. She was a hoot as is his sister Diane, two years my senior, but for whom I carried a serious torch. All in all, a nice family, typical Cape folks and I send condolences to Moose’s family. May he rest in peace. Thanks Ken. Great informative blog on Kermit. Nice article in Missourian by Trent Singer today too. Central’s Kermit Moose Meystedt drives to the basket in a game at Notre Dame High School in this archive photo circa 1962-1963 by G.D. Fronabarger. More than two decades after his basketball career had ended, Kermit Meystedt never dismissed his roots. In 1993, Meystedt put forth an idea while chatting with Terry Kitchen, who was Central High School’s athletic director at the time. For years, Central teams had competed on the gym’s synthetic surface at the school — now known as Central Junior High School — that only got harder as time wore on. After repetitive practices, players were often forced to deal with shin splints and knee problems, and the playing surface was the issue. But Meystedt’s initiative was the solution. The cost for a new wooden floor was $75,000, but Meystedt spearheaded a fund-raising effort to give back to his alma mater. The accomplishment was one of many in the life of Meystedt, who died Saturday at the age of 69 after a three-month battle with liver cancer. A hall-of-famer at both Central and Southeast Missouri State, Meystedt is remembered by those who knew him closely more for his generosity off the court than his abilities on the court. “He was self-made,” said Charlie Bertrand, who started alongside Meystedt for three seasons at Southeast. “He was very successful, a very giving person. He cared about everybody, and he would be the first to give somebody a handout or give somebody in need. He was that type of person. Meystedt was born July 20, 1945, in Cape Girardeau, son to Clarence and Hazel Meystedt. He attended junior high school at Trinity Lutheran, where he played basketball against Curtis Williams. In the ninth grade, however, Williams and Meystedt joined forces at Central, and the two began illustrious careers together. Meystedt quickly earned the nickname “Moose” during his four years at Central. He was named first team all-conference and all-district in 1962 and ’63 and was the Tigers’ leading scorer and rebounder his senior year, during which he earned honorable mention all-state honors and set a single-game school record by scoring 47 points against Farmington. “At the time he was playing here, I was in grade school,” Kitchen said. “I remember watching him, and I was just marveled about how good of an athlete he was. All I heard all the time was ‘Moose Meystedt, Moose Meystedt,’ and you know what? It was all true. Meystedt also excelled on the baseball field under the direction of legendary coach Leon Brinkopf. He took the mound in 1962 at Busch Stadium and won a 4-2 decision over St. Louis University High School in the state championship game, capping off a perfect 21-0 season. Meystedt also played first base for Central and was named first team all-conference and all-district his junior and senior years. 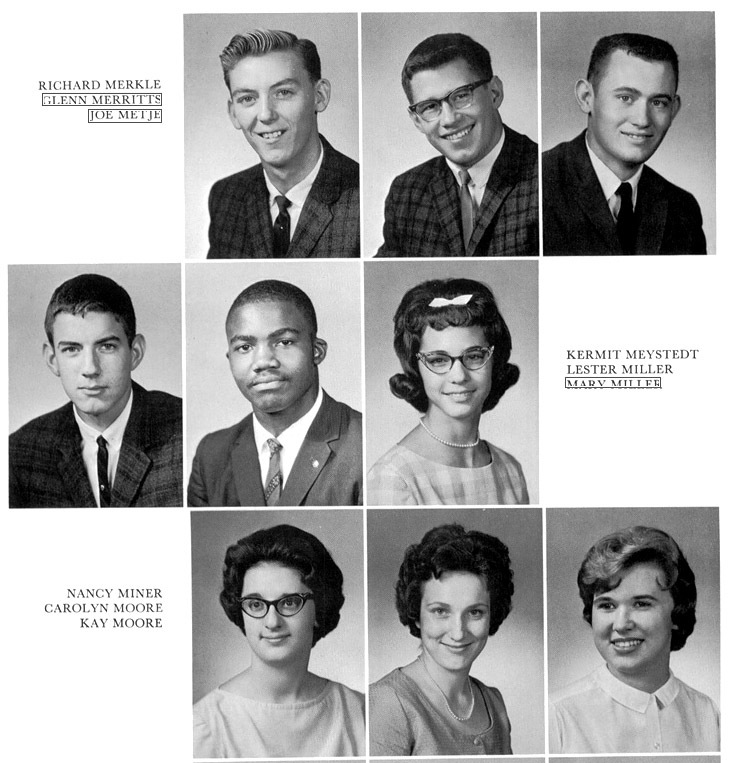 In the fall of 1963, the 6-foot-4 Meystedt continued his playing career at Southeast, where he received a four-year scholarship to play basketball and was a two-sport athlete. Meystedt earned first-team all-conference honors and was an honorable mention all-American in 1966-67. He led the Redhawks in scoring and rebounding and set a single-game school record with a 52-point performance against McKendree on January 14, 1967. He also set the single-game school record for field goals made (24) and field goals attempted (34) during the same game. The records still stand today. Williams earned a track scholarship at Southeast and joined the basketball team his sophomore season. The first African-American student-athlete at Southeast, Williams was chosen as the team’s Most Valuable Player in 1967, but the decision definitely wasn’t unanimous. Meystedt finished his college career with 1,141 points and is currently the school’s third all-time leading rebounder with 834 boards. He signed a professional contract in 1968 to play for the Kentucky Colonels of the American Basketball Association but broke his wrist during inter-squad practice just before the season began, thus ending his career. Bertrand played point guard for Southeast and vividly remembers Meystedt’s playing style. Meystedt was inducted into Central’s hall of fame in 1995. He was joined by Williams as two of 12 members inducted into the Southeast hall of fame in 2003. My freshman year I was in the same study hall with Kermit and several other basketball players. We had a very stern no funny business woman supervising the sea of students. As you recall, study hall was located in the library, and our study tables were between the short stacks. Every day, at some point in the class period, one or more of the guys would give the famous “Moose call”. Laughter always broke out, and it took awhile to settle us down. The first few times it happened were surprises, but after that we all knew there would be a call and then commotion. It drove the poor woman crazy. She never caught a single culprit!